In a stunning change of circumstances over the past thirty to sixty days, Wisconsin Governor Scott Walker will be officially ending his 2016 presidential campaign as of this evening. At one time considered the top name to beat in Iowa, Walker has faded quickly from the lead and entered polling obscurity following last week’s Republican presidential debate. Walker’s support had been drying up but the major issue which set in was the lack of money. Walker built out a very, very expensive and costly ground game in Iowa but due to falling poll numbers, the funding to run that operation has evaporated and the campaign simply cannot continue in a competitive manner. Look for Walker’s support to head toward Rubio and perhaps a mix of others including Ted Cruz and Jeb Bush. Carly Fiorina may also benefit from this news since she’s been working on securing donors off the heels of her powerful debate performance last week. Oh gee, I am so surprised. I hate to say it, since I think Paul could/should be doing better, but the fact is that he is not making a mark. They won’t split it that way, but I’m betting from here forward there will only be 1 debate with a cut-off of the top ten candidates. Period. No more extra debates and/or carve-outs since the field is narrowing and some others need to get the hint. I think your kids table list still includes some viable names and I think Walker dropped out too soon. Christie is STILL hanging in there helping himself with debate performances. Walker tanked in the first two, but it’s only September. Why drop so soon? Yeah. I said they were ALL viable, but having even ten people on the stage at once is WAY too many. Walker dropped out because he’s at least smart enough to know he was in the toilet, fighting the undertow. . .
5 candidates get first 90 minutes, remaining 5 get the remaining 90 minutes. Candidates chosen at random. Each block gets the same questions as time allows. That way only 5 people on stage at a time but there’s no “kids table” stigma since the lineups are chosen at random. That’s a good idea. Except that it wouldn’t be fair to give the same questions, so the later people could prepare. How about three candidates in three separate debates at the same time, and broadcast the second two after the first, live one. That way, the same questions could be asked. But I also like the idea I suggested earlier: Five nights of an hour each, pitting just TWO candidates each night. A mini-series. It would be a lot more thoughtful. Questions would be different for each. Then we could compare the Cuban answers, for example. The possibilities are endless to make them more interesting and/or informative than the standard ten people on stage yelling over each other for air time. Networks like that format though since it creates the most entertaining fireworks. Since the RNC wants the most eyeballs looking at their candidates, they give the networks leeway to produce and advertise it however it sees fit. 1) Bush — a Neocon, a RINO and an Israeli shill (he pledged allegiance to the foreign state of Israel…!). Plus, his Mexicana wife has trained him like Pavlov’s Dog to do what she says — more illegal Mexicans, Olé! 2) Christie — a Neocon, a RINO and just a fat New Jersey disgusting mafioso pig that still holds his tyrannical state in unconstitutional REFUTATION of the 2nd Amendment! 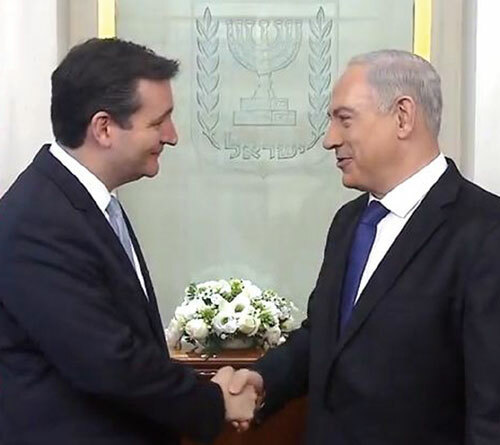 3) Cruz — an Israeli shill (he also pledges allegiance to the foreign state of Israel…!) Remember last year when Cruz admonished American Citizens that if they (US Citizens) won’t stand with Israel, he, Ted Cruz, won’t stand with them! No wonder, since his wife was a Goldman Sachs bigwig! 4) Fiorina — an Israeli shill (she also pledges allegiance to the foreign state of Israel…!). In each of the “debates” she stated she’ll listen to her good friend BB Netanyahu and do what Israel asks is best for them! A passionate sales-lady, she is willing to sell USA for the benefit of Israel…! Enough is enough with these creatures that kowtow to AIPAC and Israel — time for America to wake up and realize that WE ARE FREE PEOPLE, not some tiny foreign nation’s pawns! Rubio — another Israeli shill (also pledges allegiance to the foreign state of Israel…!) at 1:39 (in the video of the CNN “debate” below) he states that the number one mission a US President has is not to respect Iran, but to respect the President of Israel. Who are these creatures claiming to be Americans, yet seeming to run for what’s best for Israel, not the USA…?! Carly Fiorina promises to make Israel her first phone call as president. Mike Huckabee is “just nuts” about Israel. Marco Rubio has taken to dining with top-donor Sheldon Adelson. Ted Cruz is making the rounds with Fire Island’s pro-Israel community. And, Lindsey Graham who has not announced his bid, said if he is president he will have the first “all-Jewish” cabinet.